off background, Justin went to Ephesus to pursue study in philosophy. After experimenting with various philosophical schools, most importantly Stoicism and Platonism, Justin was struck by a chance meeting with an old man who told him of the prophets of the Old Testament. This led to his conversion to Christianity. He had never been able to reconcile the quiet calmness of Christians about to be executed with the immoral lives they were supposed to lead. 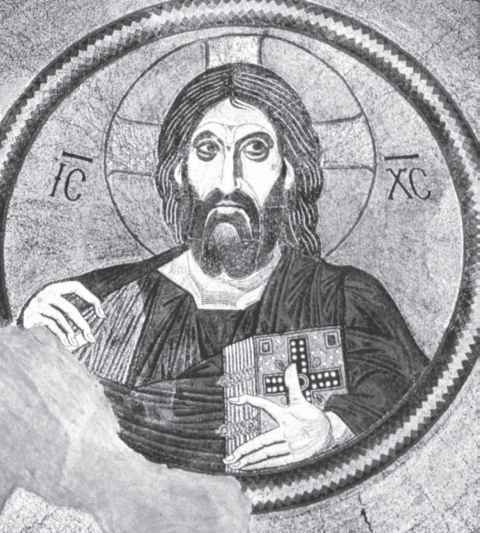 Throughout his life in Ephesus in Rome, he wrote many works, some in defense of the faith, some against Gnosticism. 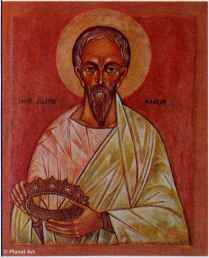 Justin embraced both pagan philosophy and Christianity. Plato, who believed in the immortal soul, was right about much. Embracing the parable of the sower, he insisted that God scattered the seeds of reason and truth across the world, not simply among the Jews. Thus someone like Plato was like Abraham, one who by divine revelation approached Christ before his coming. He was among the first to train philosophical thinking on the question of Christ's relationship to the Father. Christ comes from the Father, but takes nothing from him. Like the passing of a candle flame to another candle, Christ is "Light from Light." Made flesh, Christ is the medium by which the transcendent God is made fully manifest in the world. With several other associates, Justin was arrested around 165, tortured, and executed.